Description: Actually a 2-6-6-6 Allegheny, built by Lima in 1941. Not able to use the picker for that model. Description: This engine is now parked inside--great for preservation--terrible for photography. Title: Lookit all them drivers! Description: C&O's biggest steamer, the 2-6-6-6 Allegheny. I used to play on this engine as a kid when it was on display in Roanoke. 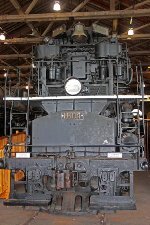 It was sent to a shopping mall, and later the B&O museum after a flood devastated the Viriginia Museum of Transportation in 1986. Description: Two days before the Japanese bombed Pearl Harbor, the Chesapeake & Ohio railroad received its first 2-6-6-6 Allegheny type locomotive. The C&O adorned these mammoth steamers with the name Allegheny for the West Virginia Mountains they climbed, pulling coal trains at 15 miles per hour. During World Was II, these locomotives hauled military troops and supplies. 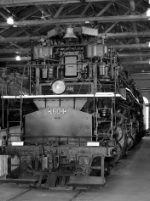 Capable of pulling passenger trains at 70 miles per hour or more during the war, these Alleghenies were considered the finest locomotive ever produced by Lima Locomotive Works. Eventually, 60 Alleghenies were in operation on the C&O. The first was retired in 1552, while some remained in service until 1956, pulling secondary passenger trains. All were retired by the end of that year. 1604 was 1 of 2 that escaped scraping. Description: They moved the 2-6-6-6 (Allegheny) inside. It's great from preservation, but terrible for photgraphy (contrast to the shot I took in 1998 when the #1604 was still outside). Description: This steam engine will put an 80MAC to shame! One of the biggest steam engines ever made, this C&O Allegheny dwarfs damaged cars to the right from the collapse.